The past January 25th, one of the worst environmental and humanitarian disasters in the history of Brazil took place. 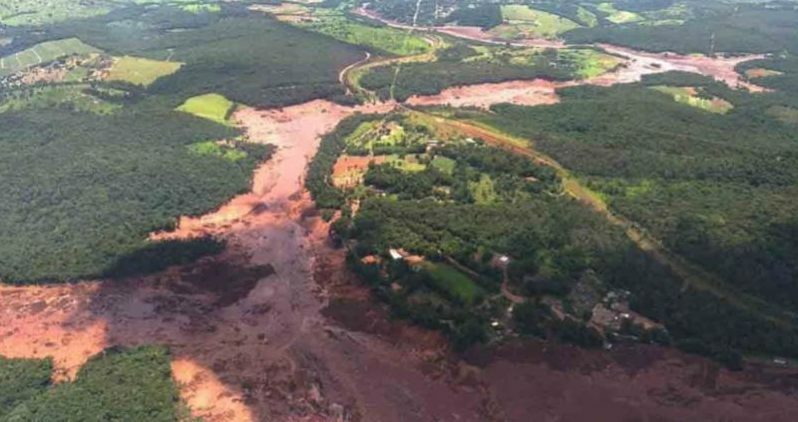 The breakdown of the Bumardinho dam, operated by Vale S.A., the biggest world iron and nickel producer, resulted in 157 casualties and 162 missing people (information collected at the beginning of February). This disaster has brought back to the spotlight the risks faced by the population and environment surrounding mining sites, an activity that generates wide profit margins. Besides, the situation is even more concerning if we consider that the same company was involved in a similar accident in 2015. Chile is no exception when it comes to environmental disasters. In 1965, there was a major earthquake measuring 7.6 on the Richter Scale, which caused the collapse of a tailing dam located in El Melón. The incident resulted in 35 casualties and 350 missing people. El Mauro tailing dam is another risky case. Located in the city of Caimanes, this tailing has over 1500 million waste material and its retaining wall stands on a very unstable area. On top of the environmental impact its construction had, now there is concern about its physical stability in the event of an earthquake. The concerns raised about the stability of the tailing dam has two main aspects: chemical and physical. The first one focuses mainly on prevention, the aim is to avoid an acid mine drainage. The second one is an attempt to prevent the overflowing or collapse of the tailing, like what happened in Brazil. In Chile, the main factor for concern is the earthquakes that can cause failures due to tailing liquefaction. 52,2% of them are located in the Coquimbo Region, 21,8% in the Atacama Region, 10,9% in the Valparaiso Region and 15,1% in the rest of the country. 23% of the tailing dams are abandoned, 63% are inactive and 14% are active. The different solutions that are being proposed are focused on physical and chemical stability, repurposing of valuable waste materials and safe and stable replenishment of tailing dams. Here you can read about some examples funded by private corporations, academia, and the government. 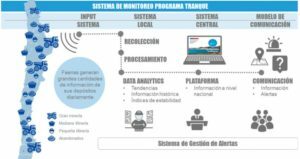 This is one of the main projects of Alta Ley and it is looking for a standardized monitoring and early warning system to be integrated internationally. The key to this system is that the information input will come from the different players involved in the generation of these environmental liabilities. The goal of this system is to provide high-quality, relevant, complete, and reliable information about the chemical and physical stability of the tailing dam. This integrated monitoring system aims to improve the operation of the companies and the supervising body (Sernageoming). This program also improves the trust and coordination of the different parties affected by these tailing dams. 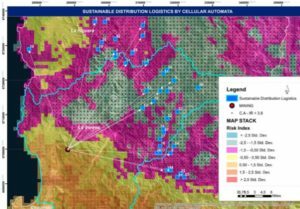 The goal of this solution is to recover valuable materials in the 718 tailings that have economic potential. The recovery is being carried out by Ecometales, a Codelco subsidiary, together with JRI. The underlying idea is that technological development currently enables the cost-efficient exploitation of mineral deposits. The composition of these tailings is gold, silver, copper, rare earth, arsenic, zinc, lead, etc. In order to create a profitable business, a technology that correctly separates the valuable materials from the pollutants is needed. To solve this challenge, a group of professionals and professors from the Technical University Federico Santa María, in Chile, came up with a spatial dynamic model to find optimal locations for this waste. The model uses multiple georeferenced variables integrated within a GIS to perform a multi-criteria evaluation and establish analytical prioritization processes. These variables include the presence of cities, precipitations, secondary geological structures, among others. Here is an example of the optimal locations suggested by the model. Even though it has not been massively used in the industry, it was awarded ‘Best Paper’ at the EGTEIC congress. Recent studies by academics from different countries show that there is clear potential for the use of tailing materials in the manufacture of construction bricks. This can be done through the geo-polymerization of the granular material, which will be transformed into a strong solid. The current efforts are focused on finding different additives that enable the manufacturing of even stronger bricks in order to meet the existing market demand. The research undertaken by Lianyang Zhang, Ph.D. from Arizona University, is an experimental case about the use of tailings in construction bricks. The circular economy has become a trend in the mining industry in an attempt to improve its sustainability, but not only in the application of control and mitigation measures. Another example is the challenge solved by the ennomotive community of engineers. In this challenge, people submitted different applications used in other industries to repurpose waste materials from tailings. After the completion of the challenge, two viable solutions that are still being developed were found. One is a new product for the energy sector and the other is an application for a different industry sector. Share with us some ways to make tailings more sustainable and explore what ennomotive has to offer.